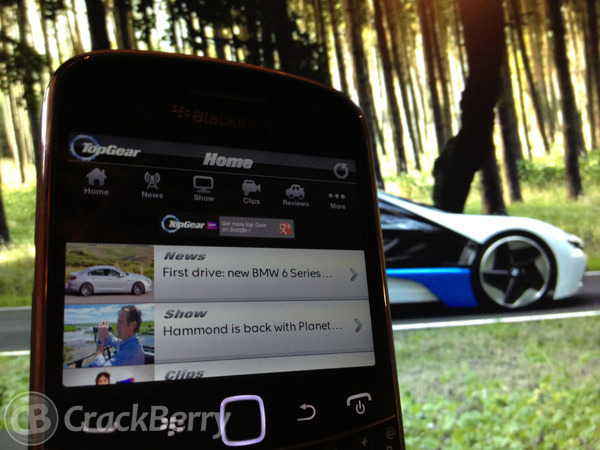 BBC Worldwide has developed an application for the hit show Top Gear and it's now available on the BlackBerry platform. Top Gear – News is available on the BlackBerry PlayBook as well as BlackBerry smartphones. The application has been designed to allow fans to keep connected when they missed an episode and between episodes. The application features latest news updates, Top Gear opinions, videos, and a whole lot more. From within the application you are able to read the latest articles and share them with your BBM contacts. Of course if they do not have the app they will be prompted to download it to read the post. Along with BBM integration you can also share via FaceBook, Twitter, and email. Of course, the Playbook doesn’t have BBM connected capabilities, but its version still offers a lot of the same features you would find on the phones. The benefit to using Top Gear on the PlayBook is that you will have a larger screen to watch the video clips. Top Gear on your smartphone is perfect for portability, it isn’t the best for viewing video. If you have both a BlackBerry smartphone and tablet I would highly recommend downloading the application on both. With the app on both you’ll never be out of date on the newest from Audi, BMW, or Porsche. If you have not watched Top Gear and have a thing for cars I suggest you download the app, and check your local listings for availability.